When you go to see Dr. Barrett, your dentist in SW Portland, rest assured that our team has your dental health in mind from every angle. That’s why we were interested in a recent study that came out on the effects of the chemical bisphenol A, or BPA, on tooth enamel formation. Bisphenol A is an industrial “ingredient” used to make polycarbonate plastics and epoxy resins. Commonly, BPA can be found in food storage containers or beverage containers like water-bottles. It also may be present in the lining of canned goods. BPA has been in use since the 1960s but has recently come to the public’s– as well as the scientific community’s– attention when it was targeted as a xenoestrogen (a compound that mimics natural estrogen in the body, potentially disrupting normal hormone function.) As a result, many large manufacturers of plastics have come out with BPA-free products– but others containing it are still on the market. The study, conducted at the French National Institute of Health and Medical Research (INSERM) in Paris, examined the effects of BPA specifically on enamel formation in children. The human body makes its dental enamel beginning in the 3rd fetal trimester until the 3rd or 4th year of life in a process called amelogenesis. Researchers wanted to examine the effects of fetal exposure to BPA. To do this, the scientists exposed rats to comparable levels of BPA from the time they were in utero until 30 days after birth. They also isolated and studied the rats’ ameloblast cells– the cells responsible for enamel formation– when exposed to BPA. In both parts of the study, researchers found noticeable effects on tooth enamel in rats exposed to BPA, as well as a cellular impact of BPA on the ameloblast cells. The tooth abnormality specifically under examination is called molar incisor hypomineralization, a condition in which the enamel is weaker in molars, incisors, or both. The condition appears as opaque white or brown spots that are especially vulnerable to decay, sensitivity, and pain. At the moment 18% of children aged six to nine years old have molar incisor hypomineralization, but despite this large number experts are still unsure what cause– or causes– is bringing this about. Do you have questions about this study? Looking for more information about how environmental factors like industrial ingredients may impact your dental health? 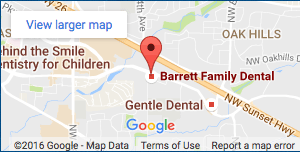 Ask us at your next appointment with Dr. Barrett, your dentist in SW Portland. Thank you for sharing these findings! Buying containers that are BPA free is an important step in preventing tooth enamel issues.